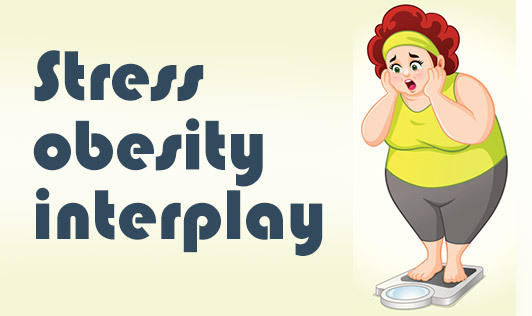 Stress and related conditions like increased anxiety and dysphoria could decrease the motivation to engage in regular physical activity, thus adding a step towards obesity. Cortisol- a stress hormone, has an intricate relationship with insulin. When faced with stress, cortisol provides the human body with glucose to fight the stress, while suppressing insulin production to prevent the storage of this glucose. Chronic stress coupled with unhealthy lifestyle patterns prevent the use of this excess glucose, thus leading to increase in sugar levels and weight gain. Excessive cortisol in the body can cause a serious condition called, Cushing’s syndrome, a cluster disorder with symptoms that include weight gain, depression, high blood pressure and diabetes. The health conditions like diabetes, hypertension, cardio-vascular diseases, that often accompany obesity could also lead to stress, as coping might get overwhelming. Know your stress triggers: Think ahead about what upsets you. Whenever you feel the stress rising, take a moment to yourself to think about the situation that has caused stress. Differentiate between emotional and actual hunger: Every time you have an urge dig into some delectable food, ask yourself why you want to eat. Is it because you are truly hungry? Or is it because you are upset and worried? Focus on what you can control: Using your stress tracker, track your stressors, and understand which of them are under your control. Come up with ways to tackle them. Relaxing is important: Even if you are busy, take 15 to 20 minutes a day to sit back and relax. Try practicing relaxation techniques like meditation, progressive muscle relaxation or yoga. Engage in regular exercise: Exercise not only promotes good physical health but does wonders for your stress levels. Regular exercise boosts endorphins while reducing cortisol, thus reducing stress.